Screaming hooligans, evil clowns, bopping curls, wailing ducks, raging mephistophelesâ€™s, oil tanker martinis, fourâ€™ed sevens, what was thatâ€™s, one note sagas, stuttering idiots, a night in Ethiopia, frothing thrillers, utter chaosâ€™s, retrograded themes, Bulgarian cafes, fragmented fragments, ladles of groove sauce and mouthfuls of Australian grass. 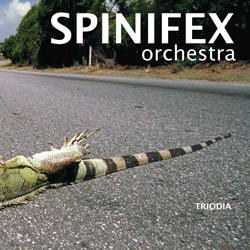 Triodia is the unleashing of the Spinifex Orchestra, Karnatic Labâ€™s wild chamber jazz band. Goes well with brunch.